Once you begin to understand where you are — really and truly — a change, a profound change, will begin to occur within you. You will be unable to prevent it. Initially — even necessarily – it will come to you through your understanding, and as you enter more deeply into the realization of where you are, your understanding itself will begin to be eclipsed by something deeper still, by something more vital. Understanding will “tell” you where you are — but faith will take you beyond the appearances, to the the realities beneath them. The change that will come will occur within you — not in the appearances of things about you. Jesus Christ is being crucified before you. He is on the Cross! And you are witnessing it. You are even taking part in it! But now you witness it before you, take part in it ... see the unspeakable value of your life (in His love for you Christ suffered and died) ... and the consequences of your choices (the sins by which and for which He suffered, was crucified, and died) ... right before you! Time, we told you, had been left in the vestibule as we entered the Church. It no longer divides us from that day. We have entered into something sacred, and everything sacred is invested with the eternal, for it pertains to God Who IS eternal; Whose Son is eternal; the Son of God, now here before us on that Cross of agony hewn from our sins. How then will you enter? 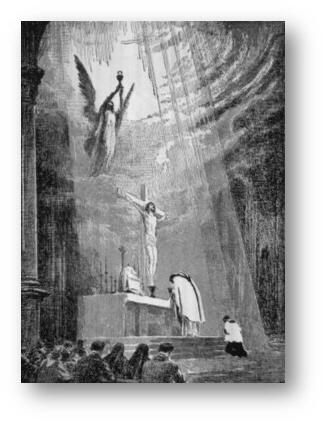 Everything that leads up to the Canon of the Mass (that most sacred part of the Mass in which the Consecration occurs, when the bread becomes Jesus’ Body, the wine His Blood) is a prologue to that epic moment when He will be sacrificed before you. When you passed the doors leading into the Church and toward the Sanctuary, you began to wend your way through the road that leads to Golgotha, the Place of the Skull, the Mount of Crucifixion — the Altar of Sacrifice. How, then, will you enter? What we have learned today: The Mass is the enactment, really and truly present before you, of Jesus’ Sacrifice on Calvary, and you have a very real part in it.